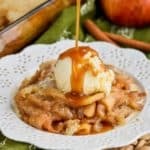 This Caramel Apple Cobbler Recipe is the perfect combination of delicious tart apples coated in cinnamon and smooth homemade caramel, all in an amazing warm apple cobbler, made from scratch! 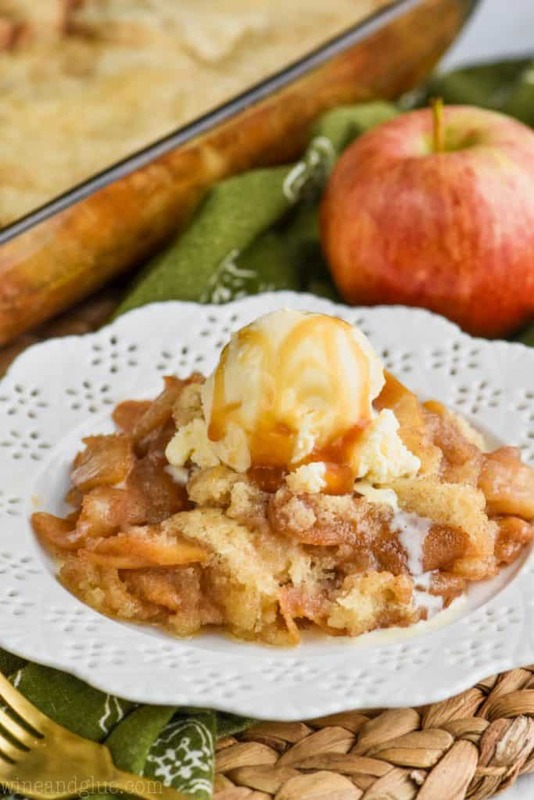 Its the old fashioned apple cobbler recipe you are looking for. If you are looking for other great from scratch recipes, make sure you check out this Red Velvet Sour Cream Bundt Cake, these Pumpkin Sugar Cookies, and this Chocolate Chip Cookie Cake! I’ve recently updated this post from September 2015 with new pictures and a video. I really debated just deleting the content and posting as new, but I love this post so much. Plus look at that cute picture of my kids smaller! This time of year continues to be difficult and hard for our family, but I promise to be back with new stories of back to school and my chaotic life. Happy fall guys! 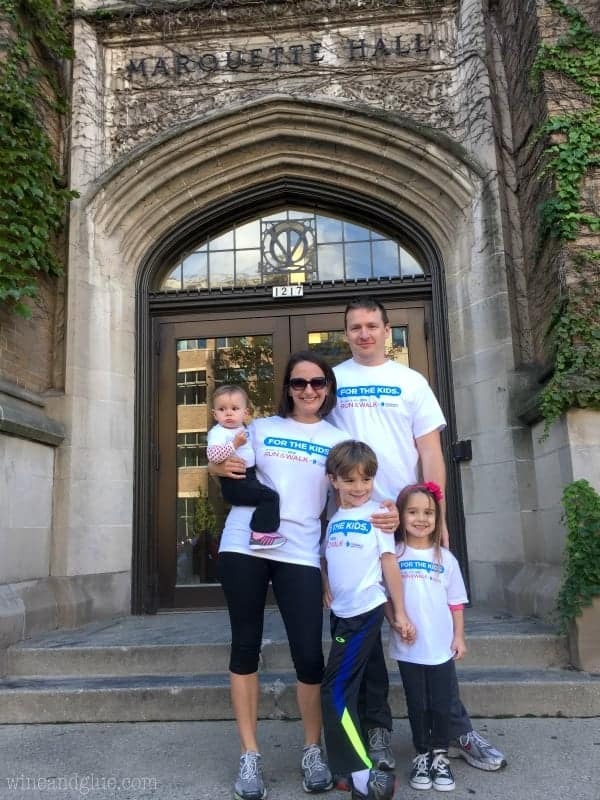 Over the weekend we did a walk to raise money for the hospital where Elliot spent the one week of his life. This is the sixth year in a row that we have done the walk in honor of Elliot. Besides the walking piece, that’s pretty much exactly how I feel about it too. I kind of love it when my kids can so easily put into words what everyone else is feeling. 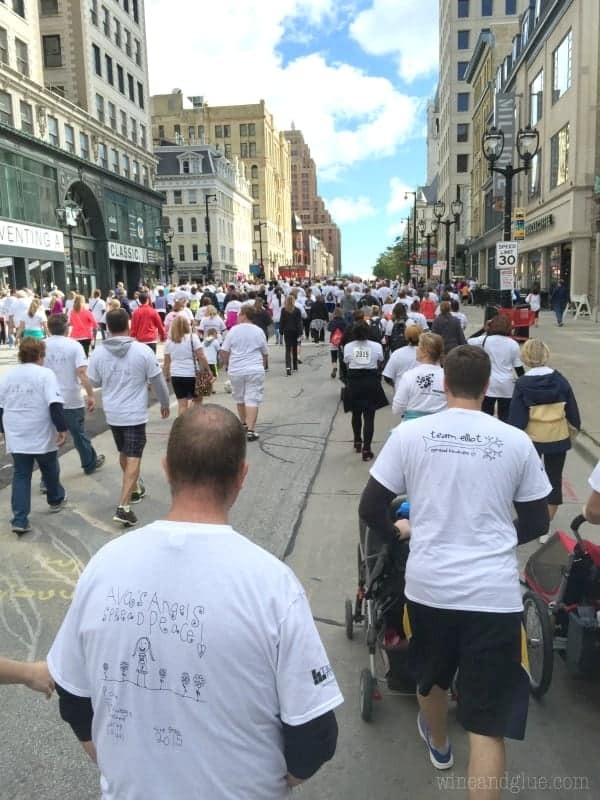 There are thousands upon thousands of people who do Al’s Run every year in support of Children’s Hospital of Wisconsin. It’s a pretty amazing place that has helped so many kids in the midwest. As you walk, and this is the part that always makes me so emotional, you see the backs of all these shirts. Most, maybe all, are graphics that represent these teams made up mainly of adults who have all come together in honor of one child. Lots and lots and lots of those children are still alive. Some of them are even wearing a special bright shirt with their own name on the back and walking with their families and loved ones. This year I saw a shirt with the name Olive on the back. A little girl who’s birth and death dates, just a few days apart, were on the back of all these shirts. I almost stopped them and said, “Someone find me Olive’s mom!” I just wanted to give her a hug. She’s only one year out from losing her daughter. And I just wanted to tell her that it doesn’t stop hurting, but five years out, I can say that it starts to not be such a paralyzing pain. In the midst of it all we found a short second to take our picture in front of the building on Marquette’s campus where Nathan and I first met sixteen years ago. (Awesome photo credit/chaos control credit to Cathy.) We have a similar photo from our wedding day eleven years ago . . . you know minus the kids. It’s pretty incredible to think of how far we’ve come. 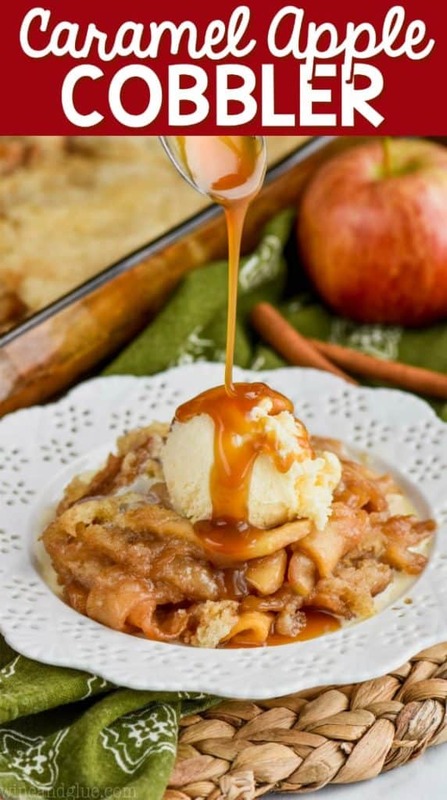 And with that, I will get to this incredible caramel apple cobbler recipe . . . thank you all for letting me ramble at you several times a week. There is not a day that goes by that I don’t think of those who visit my blog with absolute gratitude. It’s because of you that I get to do this amazing job. 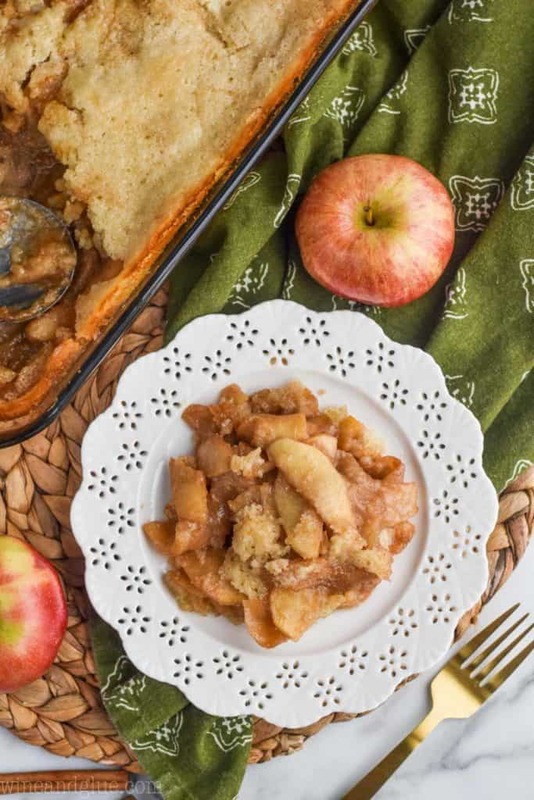 This homemade apple cobbler recipe is not made with apple pie filling, but with fresh apples. It has the most delicious caramel sauce! If you want more caramel apple recipes, you will want to try this Caramel Apple Sangria and this Caramel Apple Poke Cake. For another fall favorite recipe, check out these Pumpkin Sugar Cookies! 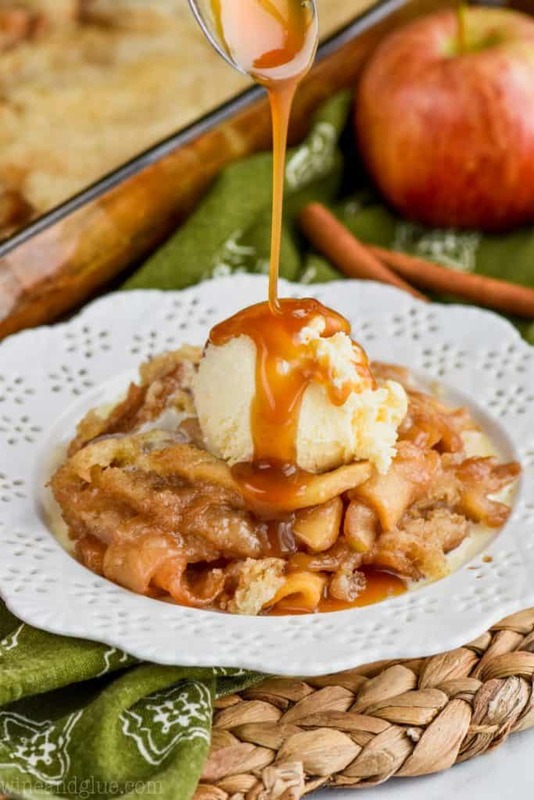 This Caramel Apple Cobbler is made completely from scratch. I’m not going to lie, it’s a labor of love . . . but totally worth it. The peeling of the apples into the big bowl at the start makes me think of Sundays as a kid, when my dad would peel apples for an apple pie while watching the Packer game. I think peeling and cutting apples goes a lot faster if you peel them, core them, and then cut them. Or you could buy this handy tool. While your apples are cooking down, get started on your caramel sauce. It makes it go a lot faster if you cook both at the same time. 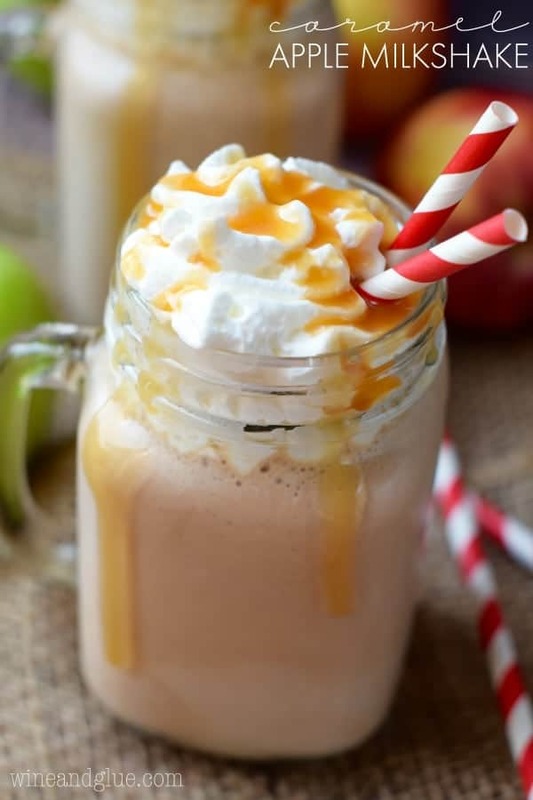 Once you have peeled and cooked your apples and made your caramel sauce, the rest of the recipe comes together fast! 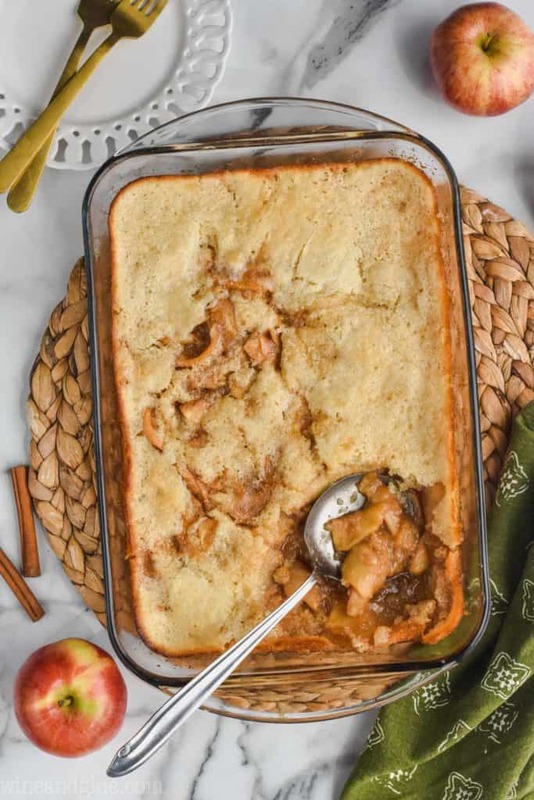 This Caramel Apple Cobbler is the perfect combination of delicious tart apples coated in cinnamon and smooth homemade caramel, all in an amazing warm from scratch cobbler! Preheat your oven to 400 degrees and pull out a 9 by 13 baking dish . Combine your apple slices, 1 tsp cinnamon and 2 TBSPs granulated white sugar in a large sauce pan over medium low heat. Cook the apples, stirring regularly until they are soft, about 10 minutes. While the apples are cooking down, combine 1 cup brown sugar, 1/2 cup (one stick) unsalted butter, 1/4 cup heavy cream in a small sauce pan over medium heat. Stir consistently until the mixture begins to boil. Continue stirring for another minute or so until it is smooth, remove from the heat. Pour the 1/2 cup melted butter into the baking dish. In a large bowl, whisk together 1 cup sugar, 1 cup flour, 2 tsps baking powder, and 1/4 tsp salt. Whisk in 1 cup milk and 2 tsps vanilla extract. Pour the mixture over the butter and whisk in gently. Add 1 cup of the caramel sauce to the apples and stir to combine, reserve the rest for serving (I had about 1/3 cup left). Pour the caramel apple mixture over the batter. Bake for 20 to 25 minutes or until the edges are golden brown. Serve warm with ice cream and the reserved caramel sauce. You have such a beautiful family, and this post made me tear up! 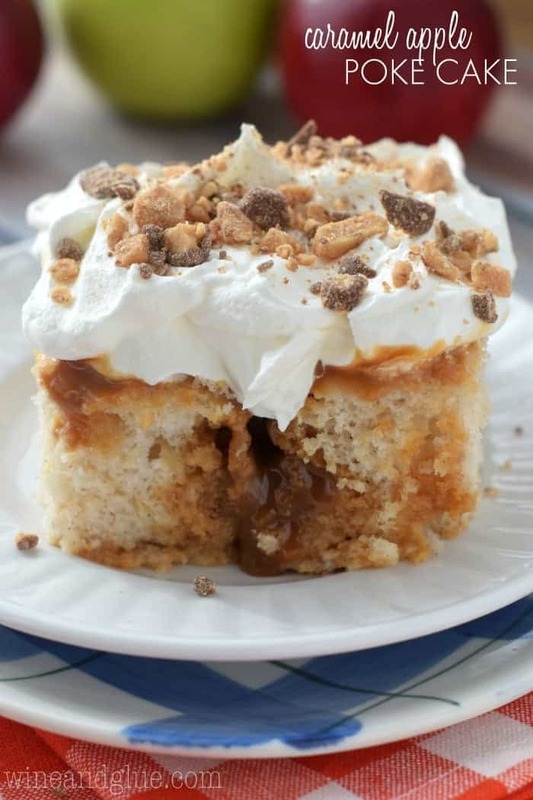 Joan Hayes recently posted…Mississippi Mudslide Cake and a #giveaway! I just made this for a clambake and it was delicious. The caramel sauce was so tasty. Will make again. You have an adorable family. I just made the caramel apple cobbler for my thanksgiving dinner hope it’s good I used weat flour. Ill tell you how I like it, it looks sooooo good! I hope you liked it Haylee! Thank you for coming back to let me know Shericka! This looks so good. I will probably make it tonight. This was great! My whole family loved it. Thank you for a great recipe. 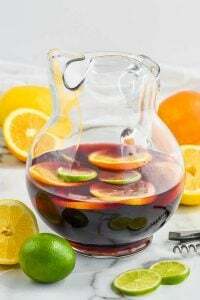 simply amazing 🙂 a much have recipe for fall! will definitely make it again. I have an excess of apples and would like to make one for Thanksgiving do you think it can be frozen? Terry, I apologize, I’m way too late answering this. I haven’t tried freezing this, but I don’t see why it wouldn’t work. 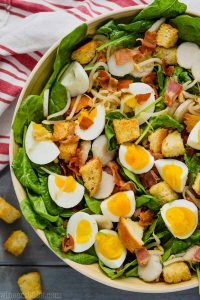 I just made this recipe and it came out wonderful. For me, it was sweet enough without having to drizzle extra caramel on it. So delicious. Hi Christina! You have likely figured this out already, but I wouldn’t make it with half and half, I would stick with heavy cream. So glad to hear it Rochelle! Okay so I was feeling mushy already and cried reading this because you are a true inspiration to me. And well this cobbler mouthwatering I love you. Pinned! 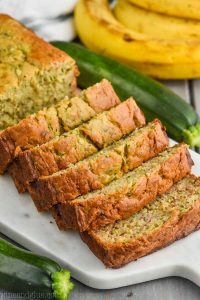 FODMAP diet for the next month and was wondering if I could tweak this and use coconut cream instead of cream and gluten free flour, she is feeling like she’s missing out on all the good things at the moment and I’m sure she would enjoy this. Holy moly! Just got done making this tonight! Best cobbler EVER! 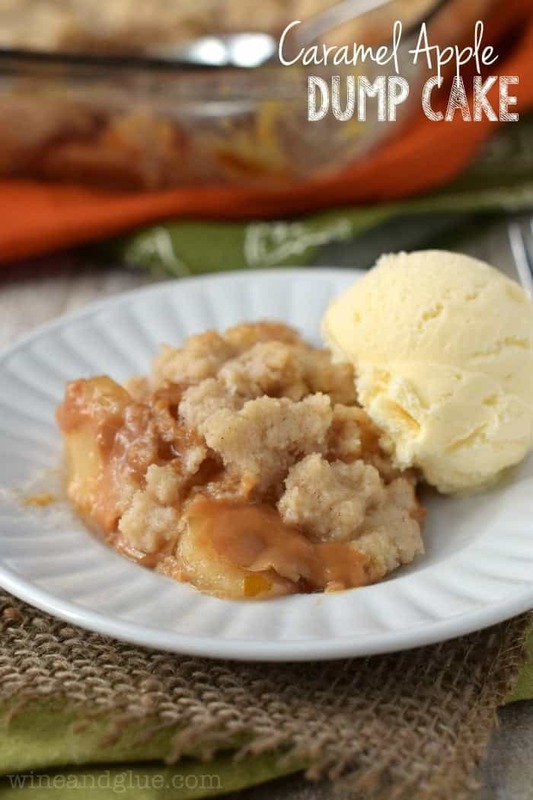 Caramel was rich and buttery, cobbler bursting with flavor! That scoop of vanilla ice cream on top really seals the deal. Seriously can’t wait to make this again. Steph, this comment made might night!! Thank you! I’m so happy you liked it! Hi Jacki! To be honest, I have never tried prepping this ahead of time and storing it before baking. I will say that it reheats well! You might want to give it a test run before Thanksgiving since it is so far off and see if you can just prep it in advance and bake once there. I made this for Thanksgiving last year and forgot to leave a comment. I doubled the recipe and made 2 pans of it. It was a HIT! just made this!! I used half and half and it is fine! A true caramel sauce! Can’t wait for dessert tonite. I hope you guys loved it! I am making two of these for thanksgiving tomorrow. Am I able to make tonight and refrigerate them u til tomorrow? Then when it’s time to eat them just warm them up in oven? Just curious about cooking this at high altitude…over 4,000 ft. I’ve read to decrease oven temp. Suggestions? Hi Michele! Unfortunately, I have no experience cooking in high altitude. 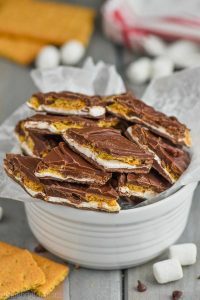 I know that there are some great baking sites out there (Betty Crocker has one and King Arthur’s Flour for example) have posts with general guidelines. I would need to refer you to that. 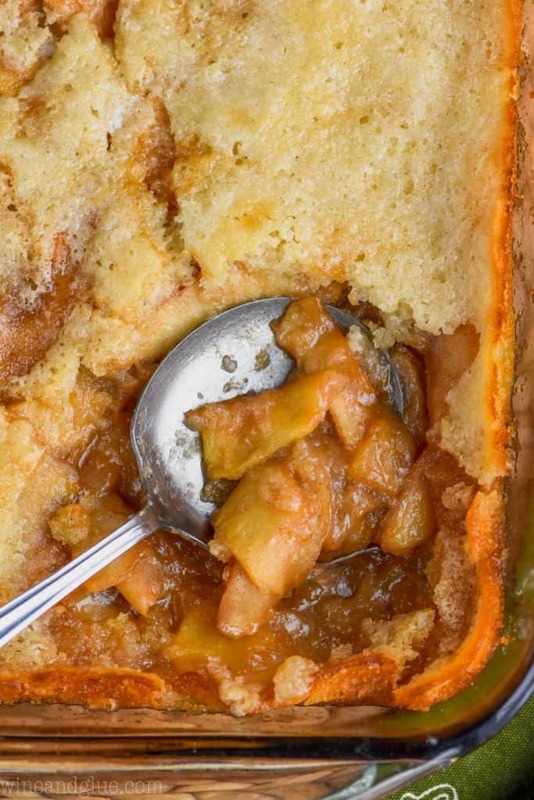 I find this years ago and this continue to be the cobbler recipe that I use… absolutely delicious. I just realize you added the caramel to the apples. I will have to try that part next time. I’m glad you’ve enjoyed it!